Alton towers is probably one the best known theme parks in the UK, located in Alton near Staffordshire its approx 46 miles driving distance from Manchester. Whatever size travelling party you have we can accommodate you here at Manchester mini bus. 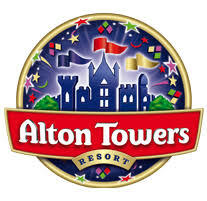 Not only does Alton towers boast of fantastic thrill seeking rides it also has splash landings, which rivals any water park you will have ever visited, a themed hotel so you can sleep over and get a head start on the rides, it also hosts varies themed events during the year including Halloween, a spectacular firework display, half term activities. Gulliver’s world is located in Warrington and is approx 18 miles from Manchester. Gulliver’s world is aimed at a younger family with recommended age limits being 2 – 13. There are over 90 rides at Gulliver’s world and even a clown school for those who not wanting to go on the rides. Gulliver’s world also has a splashzone, which may not be deep enough to swim in but promises hours of fun of super slides, springs, spinners, and a giant water bucket, not to worry if you don’t wish to partake there is a dry area, so you can observe without missing out. There is several eateries located at Gulliver’s world however you are not restricted and you can take your own food and drink. Gulliver’s world is run by a family so they fully understand what makes a great affordable family day out. Blackpool pleasure beach is approx 40 miles away from Manchester, and is home to the UK’ tallest fastest and longest roller coasters, aptly named the Big one . The pleasure beach is divided into 3 zones, there is the thrill rides, the family rides and Nickelodeon land. Altogether there is over 125 rides and attractions situated at the pleasure beach, so you could defiantly make a full day of it. The founder of Blackpool pleasure beach based his idea on the famous Coney island, USA. The Pleasure beach has fantastic history and some of its rides have featured in pop videos over the years. The pleasure beach has attractions that are open all year round, however there is an admission fee to enter the park and a wristband system in place to actually go on the rides. The pleasure beach is in close proximity to the fylde coast line so you can escape to the beach for a quiet minute away from the funfair. We can take care of all the transport that you need to travel to any of these theme parks. We also do special offers for mid week and recommend that this is when you travel as you will queue for half as long and get allot better value for your money.